I’ve always loved the Z cars and here’s one more reason: apparently Apple Inc. co-founder Steve Wozniak was featured in late 70s 280ZX. I wouldn’t be proper to draw an association to the 280Z’s reputation of being the biggest and flabbiest of the 2-series Z cars. Despite my previous four years of objections and a blog post, I’ve finally given in and decided to start using my Twitter account. Like any good resistance leader I know when to surrender and accept a position in the new order. As I predicted a few months ago, the conversations happening on Twitter would likely eventually draw me in and force me to look past the narcissism. I’ve read Twitter tags like #IranElection, #Sakai (and #Sakai09), #D2L09 and #f1. I feel like it’s time I start contributing. That and blogging with more than 140 characters is hard! The plan is that I’ll start using my mattclare Twitter account Monday July 20th and I hope to have some interesting tweets through the rest of the week….. after that week I can’t guarantee I’ll still have any good ideas left. To pique your interest, here’s a sample tweet. Hopefully you’ve got the latest update to Firefox, version 3.5. It brings a welcome speed upgrade to most web sites. For some reason, Mozilla doesn’t have a Canadian localization team, but I know that even the British dictionary doesn’t quite cut it for the truly patriotic. PDF files can be displayed so quickly on the Mac because the native display format is is based on PDF. Quickly that is if you don’t use Adobe’s application! Here’s the better alternative. Inserts preview images (thumbnails) and popularity ranks of web sites into the Google and Yahoo search results pages. This extension provides a toolbar button to easily add a selection or an entire page to Evernote. If Evernote for Mac or Windows is installed – the clips go directly to the local application — and from there they are synced to your iPhone, BlackBerry, their web interface….. ,If been using this service instead of my own memory and I’ve had fantastic results. 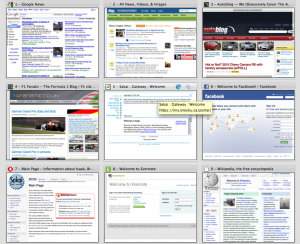 Direct access to your most visited websites as a thumbnail. Works great as a start page! It’s Safari 4-esque. I also find it handy to check-in to see what is the featured articles on Wikipedia are, what is on the top of Google news, etc. every time I open a new tab. This article can also be found in a better laid-out version in the Brock University teaching wiki. As a facilitator of Instructional Skills Workshops (ISW) [ISW organization web site] I’m concerned about using cameras for recording and reviewing mini lessons and the challenge this has become. The ISW program/model is a 25 year old, peer-based, experiential instructional development program that is designed around three mini lessons and enhances the teaching effectiveness of both new and veteran instructors. Those mini lessons involve peer-based feedback as well as being recorded for the instructor themselves to review. 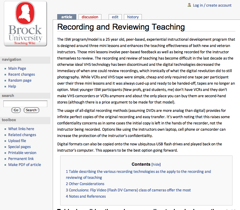 The recording and review of teaching has become difficult in the last decade as the otherwise ideal VHS technology has been discontinued and the digital technologies decreased the immediacy of when one could review recordings, which ironically of what the digital revolution did to still photography. While VCRs and VHS tape were simple, cheap and only required one tape per participant over their three mini lessons and it was always cued-up and ready to be handed-off, tapes are no longer an option. Most younger ISW participants (New profs, grad students, me) don’t have VCRs and they don’t make VHS camcorders or VCRs anymore and about the only place you can buy them are second-hand stores (although there is a price argument to be made for that model). 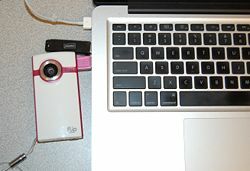 The usage of all-digital recording methods (assuming DVDs are more analog than digital) provides for infinite perfect copies of the original recording and easy transfer. It’s worth noting that this raises some confidentiality concerns as in some cases the initial copy is left in the hands of the recorder, not the instructor being recorded. Options like using the instructors own laptop, cell phone or camcorder can increase the protection of the instructor’s confidentiality. 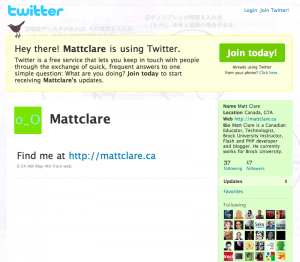 You are currently browsing the iMatt :: The Blog of Matt Clare weblog archives for July, 2009 .